As we promised last week, we’re going to divide an hour into quarters today and learn how to use the word “quarter” to express time. First of all, a quarter means “one fourth” of something. Remember? So, a quarter of an hour is fifteen minutes. Now, let’s imagine the face of a clock. It’s “five fifteen”. You can also say it’s “fifteen after five”. 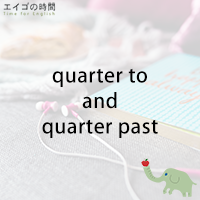 If you want to use the word “quarter”, then it’s “quarter past five.” Likewise, instead of saying it’s “three fifteen”, you can say it’s “quarter past three”. Then what about “five forty-five”? It’s “fifteen before six”. If you want to use the word “quarter”, you can say it’s “quarter to six”. Likewise, instead of saying it’s “ten forty-five”, you can say it’s “quarter to eleven”. Now, would you like to try a quiz? You’ll be given three options. So choose the one that is TRUE. Ready? 1. it’s quarter past twelve. 2. it’s quarter to twelve. 3. it’s quarter to one.